The last couple of weeks have been steady in the shop here at Fossil Forge. I have been completing a interesting display piece for the Lee's Summit School District. 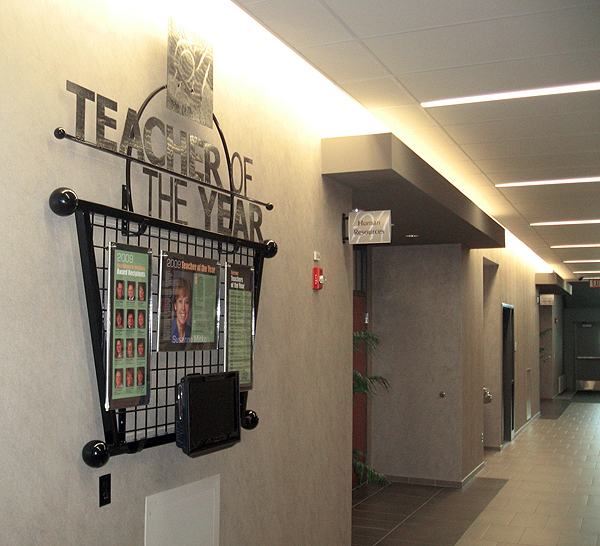 The sculpture is part of a new display showcasing the current and former teachers of the year. The frame is made from steel tube. I used large hollow steel balls to finish the corners. The letters and school district logo (a stylized graduate raising an arm, see it?) were cut from a CNC plasma system at the high school. The piece was powdercoated a glossy black. The graphic elements hanging from the sculpture are encased in acylic and attached to the grid background. This will make for easy updating of the graphics each year. Finally, I made a custom metal bracket to hold a video monitor that will highlight the teachers. Thanks to everyone who helped this project along, including the building maintenance guys who lent a hand installing it. Here’s another image and some information from a school district newsletter.